Play and share with friends! 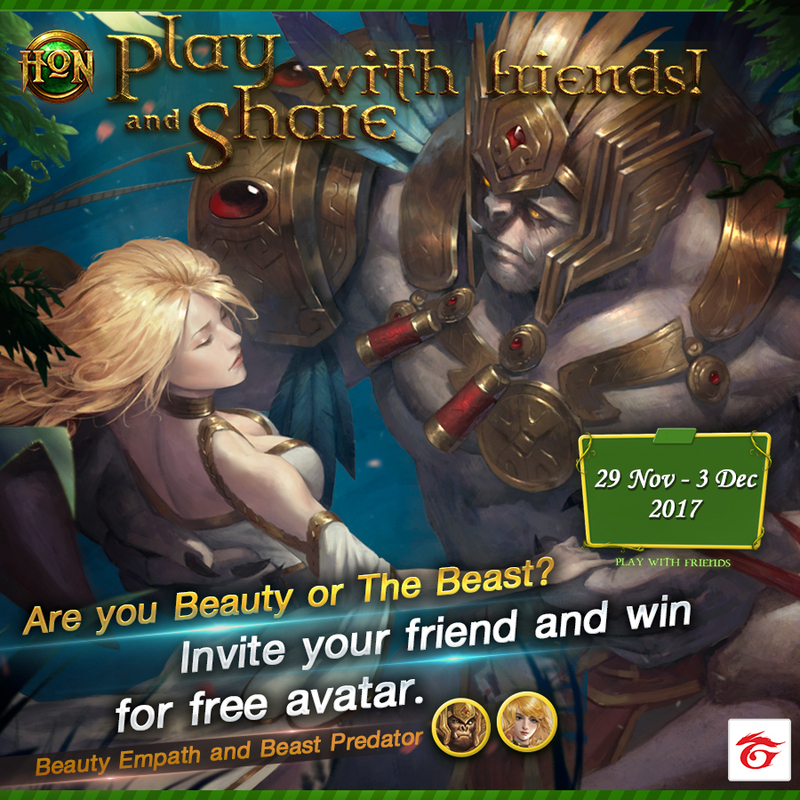 When you purchase either the Beauty Empath or Beast Predator avatar during the event period, you can get a gifting opportunity for a friend who win 3 Matchmaking games with you! If you purchase a Beauty Empath avatar, you will be able to gift Beast Predator. If you purchase a Beast Predator avatar, you will be able to gift Beauty Empath. If you purchase a Beauty Empath avatar, you will be able to gift ONLY Beast Predator. If you purchase a Beast Predator avatar, you will be able to gift ONLY Beauty Empath. Gift avatar can only be given to friends. It cannot be given to yourself. Garena reserves the right to change the rules and conditions at any time. Q : Do I have to be using either the Beauty Empath or Beast Predator avatar while winning 3 matchmaking matches with my friend? A : No, you can use any hero and any avatar and the wins will still count. Q : If I bought both Beauty Empath and Beast Predator, will I be able to gift two avatars to my friend? A : Yes, you can gift two avatars to your friend as long as you win 3 matchmaking games with your friend. Q : I have two gift avatars. Can I give them to two different friends? A : Yes, you can choose each qualifying friend for each gift at the event page. Q : 4. Why did my event win count not increase after winning a game with my friend? A : Only matchmaking FOC(CoN included) and Mid Wars games will count towards the event. Q : If the event ends before I send out my gift avatar, will the gift disappear? A : Yes, please complete the event and send out the gifts before the event ends. Q : If I receive a gift avatar from my friend, will I also get the chance to gift the other avatar to another person? A : No, only players who purchased an avatar will have a gifting opportunity.